Integrated Project Delivery (IPD) is a collaborative alliance of people, systems, business structures and practices into a process that harnesses the talents and insights of all participants. Its aim is to optimize project results, increase value to the owner, reduce waste and maximize efficiency through all phases of design, fabrication, and construction. The most popular method of IPD is Design-Build, one of the most significant trends in design and construction in the U.S. today. The Design-Build Team works under a single contract with the project owner to provide design and construction services: one entity, one contract, one unified flow of work from initial concept through completion. It consists of many players, including the General Contractor, Architect, Engineering Consultants, and a variety of sub contractors. Collectively, the team has the knowledge and expertise to complete a project from start to finish and each team member is equally important in the outcome of the project. The role of the specialty sub-consultant is no different. For example, the Fire Protection Engineer (FPE) is a critical member of the Design-Build Team, and provides comprehensive input and guidance on all aspects of fire and life safety for the project. This includes, but is not limited to, building code analysis, water supply, smoke control, fire department access, exiting, and an analysis of the active and passive fire protection systems. 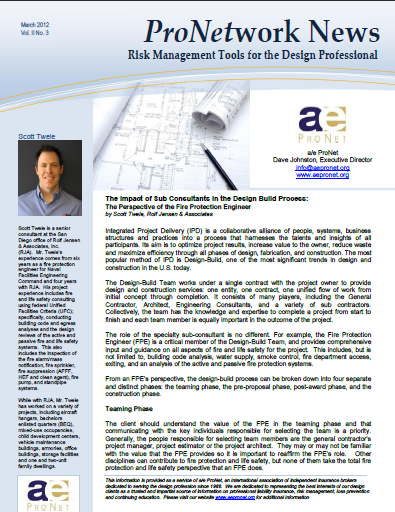 From an FPE’s perspective, the design-build process can be broken down into four separate and distinct phases: the teaming phase, the pre-proposal phase, post-award phase, and the construction phase. The client should understand the value of the FPE in the teaming phase and that communicating with the key individuals responsible for selecting the team is a priority. Generally, the people responsible for selecting team members are the general contractor’s project manager, project estimator or the project architect. They may or may not be familiar with the value that the FPE provides so it is important to reaffirm the FPE’s role. Other disciplines can contribute to fire protection and life safety, but none of them take the total fire protection and life safety perspective that an FPE does.There may be a number of teams pursuing any Design-Build project, and establishing which teams to team with, and understanding the level of effort that is expected, is critical. For example, the project could be an open bid available for many teams to compete, or it could be a Multiple Award Construction Contract where a specific set of teams is shortlisted. The FPE must consider his/her time commitment, as a short-listed project is more competitive and will take more of the FPE’s time than the open bid type of project. Depending on the size of the project, the general contractor may request an exclusivity agreement that binds the FPE or the FPE’s company to that specific project team. 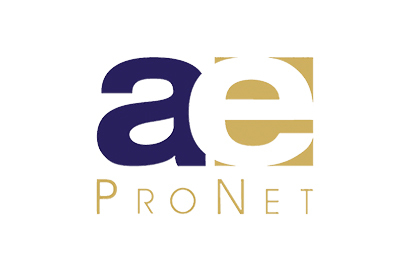 One way to address this is to provide exclusive FPE support for the project as an individual representing your company rather than making the entire company exclusive. This allows for multiple FPE’s within the same company to provide FPE consulting to multiple teams, if necessary. However, in order for this strategy to work, the project specific information for each team cannot be shared. Each project team will have a specific design that is proprietary and it is essential that the Design-Build Team trusts that project strategies and specifics will not be given away to their competition. In the pre-proposal phase, the Design-Build Team has been established, and will collectively provide qualifications for a competitive bid or design to the building owner or agency for design and construction. The FPE can support the general contractor by providing critical input to the Request For Proposal (RFP) analysis and to Request For Information (RFI) development, as well as an analysis of site layout, construction type, water supply, and knowledge of specific engineering criteria. The RFP contains all of the project specific information that the team needs to put together a package for design and construction. The FPE must thoroughly understand the fire protection requirements for that project and convey that information to the Design-Build Team. Fire protection engineering is a discipline that spans many other disciplines; so cross-coordination among the various trades is critical. Since the RFP is not always clear in design intent, an RFI to the building owner or agency may be necessary. The FPE can generate questions to help clarify areas within the fire protection requirements, and may also offer design alternatives or value engineering to realize cost savings. It is then up to the FPE to analyze the Design-Build package for compliance with specific engineering criteria, Building Codes, and National Fire Protection Association (NFPA) standards. The FPE can provide solutions that meet the code criteria yet also allow the team to fulfill its design vision. The FPE should analyze all disciplines for compliance with these requirements and cross-coordinate with the other trades. For example, the FPE can help provide solutions to construction type, height and area issues for a given occupancy type, and help coordinate fire resistive construction requirements with the team. The FPE can analyze the water supply for the site and determine if there is a requirement for fire pumps based on the flow test information provided in the RFP. If the project has engineering criteria that are specific to its Jurisdiction the FPE can help the team to understand those requirements and apply them to the project. This has been an excerpt of the March 2012 edition of our ProNetwork News Newsletters. To read more (including details on the Post-Award Phase, Construction Phase, and The FPE’s Role) download the full PDF version from our website. About the Author: Scott Twele is a senior consultant at the San Diego office of Rolf Jensen & Associates, Inc. (RJA). Mr. Twele’s experience comes from six years as a fire protection engineer for Naval Facilities Engineering Command and four years with RJA. His project experience includes fire and life safety consulting using federal Unified Facilities Criteria (UFC); specifically, conducting building code and egress analyses and the design reviews of the active and passive fire and life safety systems. This also includes the inspection of the fire alarm/mass notification, fire sprinkler, fire suppression (AFFF, HEF and clean agent), fire pump, and standpipe systems. While with RJA, Mr. Twele has worked on a variety of projects, including aircraft hangars, bachelors enlisted quarters (BEQ), mixed-use occupancies, child development centers, vehicle maintenance buildings, armories, office buildings, storage facilities and one and two-unit family dwellings.